Appropriately, Robert Taylor has chosen the Me109s of JG52 as his subject to represent the fighter pilots of the Luftwaffe in his new tribute to these courageous flyers, with his breathtaking painting Horrido! With the traditional battle cry ringing in their ears, Squadron Commander Hptm Wolfgang Ewald leads pilots of I./JG52 into combat. Based at Coquelles/Calais in September 1940, the JG-52 Me109s hurtle down in a high-speed dive to engage the enemy during the ferociously fought Battle of Britain. Robert eloquently depicts these sleek and deadly fighters high over the Channel, glinting and menacing against an ominous backdrop of heavy cumulous clouds - the world's foremost aviation artist's skill bringing to life the Luftwaffe's most successful fighter aircraft in action. 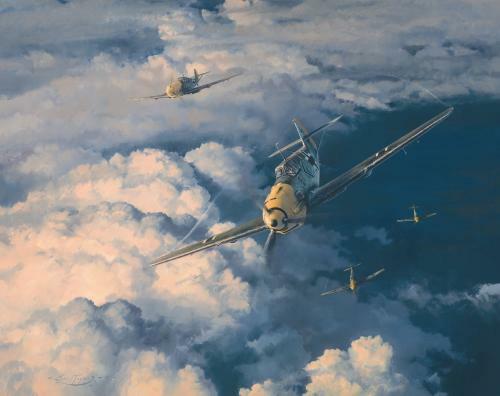 Each print has been signed an numbered by the artist along with the outstanding signatures of ten distinguished Luftwaffe Fighter Aces of World War Two, holding a total of 1225 victories between them. *ONLY 1 AVAILABLE* - We have acquired one of these rare sought after editions into our stock. It is in excellent condition and has never been framed, always stored flat.